Many natural gifts have distinguished Bsharri district in North Lebanon. This district, mostly located on the banks of the sacred Qannoubine Valley where it meets with Kadisha Valley, inspired many writers and poets by its breathtaking nature. Bsharri and Gibran are twins; once one of them is mentioned the second directly comes to mind. Gibran Khalil Gibran, a poet, writer and painter at the same time, has embodied Bsharri, Lebanon and the world’s most important legacy. Gibran wrote a lot of books and manuscripts in Arabic, English and French. Gibran lived most of his life in the United States, but his will was to be buried in Lebanon. After his death, his body was transferred to the place where he had spent most of his childhood and which was known later as Gibran’s Museum. Gibran’s Museum was founded in Deir Mar Sarkis region in 1935. Gibran asked his sister before his death to buy the building–which was Saint Sarkis’ sanctuary in the seventh century– for its spiritual value and distinguished location. A national committee was formulated to manage the estate and financial heritage of Gibran who used to own many buildings and lands in Tripoli and Beirut and more importantly to manage its huge cultural legacy. Works to expand this Museum took place in 1975 & 1995. Gibran’s Museum contains 440 original paintings, drawings and manuscripts done by Gibran himself. It also contains the tools which he used at his atelier in the United States. 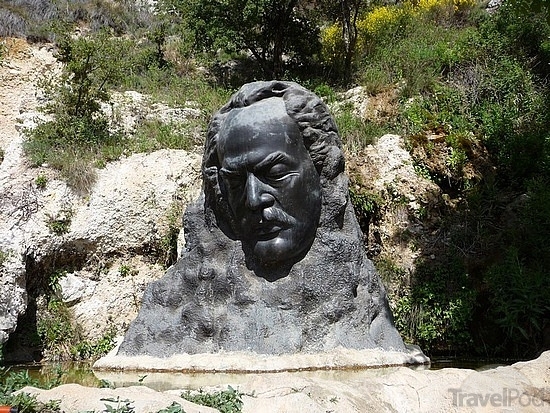 A two meter bust statue of Gibran– engraved by sculptor Roudi Rahmeh– welcomes visitors at the entrance of the Museum which receives yearly about 50,000 visitors from different nationalities. The museum consists of 16 rooms of low ceilings and narrow spaces. These rooms spread over three floors which are connected by spiral steps. At the end of the steps is the cave which Gibran wanted to be his last resting place. The cave embraces Gibran’s body and next to it are his painting stand, his writing desk, his chair and his small bed which demonstrates his short stature. In one of the rooms, two bookcases were placed; one contains Gibran’s books in both languages Arabic and English, while as the other contains general books which he used to have in his house in New York City. It also contains copybooks on which he scribbled some ideas and words. The visitor to the Museum can borrow one of the books from these bookcases and walk up to the terrace where he can enjoy reading it on seats placed there especially for this purpose. Remarkably, Gibran’s paintings demonstrate the beauty of this place and its charming landscapes. At the end of the visit to the museum, the visitor feels the greatness of an Icon from Lebanon, who prepared before his death a place to embrace his creativity. A place managed by good people who turned it to a museum, a destination for the Lebanese and foreign intellectuals who have been taken by what was written about Gibran and amazed by his writings and paintings which exceeded all expectations.